We stumbled upon an interesting issue the other day at work. A was working on adding search feature to a table/grid of cells, consisting of multiple string and date fields. The implementation used a client side search utility provided by our client SDK, which internally used tries for indexing and searching on string tokens. What is special about these date fields, we wondered, that makes this issue specific to IE? On a closer look, we found that the trie wasn’t getting properly constructed in IE. We jumped into the client SDK code, looked around but did not find anything suspicious, we also tried a bunch of other things like changing system date format, trying to enter date in a string field in another column and searching on it but the results didn’t really provide any clues. 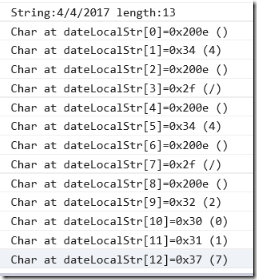 V then stepped in and looked at the part of SDK where the trie was getting built and found that it somehow was failing to add date fields to the index. 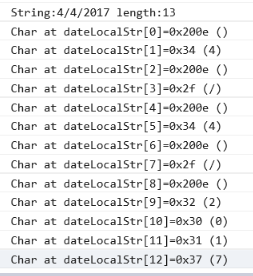 On debugging further, V found that the date string contained characters we had not expected, it wasn’t a usual string, it had stuff in it that was failing the trie construction. 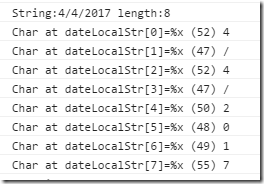 How were the date fields getting added to the index? If you run this code in Chrome and IE, this is what you’ll see. What? Chrome reports length of the string as 8, which is what you’d expect. IE has got its own characters to the party. Turns out IE adds Left-to-Right markers in the string. The value 0x200E is the unicode code point for Left-to-Right mark. 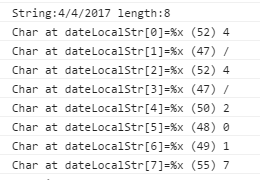 This marker gets added before every token in the date string, thus adding 5 characters to the string length.